I never thought I'd say this but after making paleo "noodles" with both spaghetti squash and zucchini, I seriously don't even miss pasta. If you don't have a julienne peeler you need to go out and get one stat (or ask for one for Christmas). 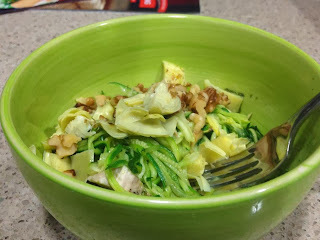 They are awesome, my only issue with it is that it's really hard (or impossible) to julienne every last bit of zucchini, I usually end up with a few thick slices in the pasta but better than wasting it! I first made this recipe with regular pesto that I bought at Whole Foods but it gave me stomach issues so I decided to use my awesome Vitamix (seriously, is there anything that thing can't do) and make my own cheeseless pesto, but you can always use pesto from a jar. You can also try adding sundried tomatoes to the pasta. Blend in Vitamix for 1 minute at Variable 7 (start at Variable 1). It will make about a cup and will keep in the fridge for about a week.